"The characters are realistic and sympathetic…The story rings true and the reader roots for Declan as he becomes more mature. Readers ages 13 and up will enjoy this story of a boy who faces his problems with the help of family and friends." "Nesbitt makes adept use of her experience working with teens. Declan's convincing observations about the world around him are sharp, but he still comes off like a real teenage boy." "Nesbitt's debut novel brilliantly captures the anger, angst, and alienation left by a socially marginalized teenager struggling to make sense of his fractured family relationships. The book touches on an aspect of the Holocaust that many young people may not be aware of. A smattering of profane language and scenes involving marijuana use and alcohol abuse provide a gritty sense of reality to this finely written book." "Vividly illustrates the confusion, elation, pain, and self-doubt typical of adolescence. 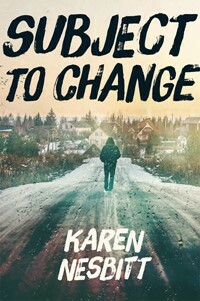 Nesbitt does a great job of personalizing issues such as homosexuality, divorce, substance abuse, racism, and poverty...It is touching to see how [Declan's] character develops and changes...All in all, Subject to Change is a gritty, touching, well-told story with great character development." "This is a realistically portrayed segment of the teenage population that is under represented in literature. The author...seems to have significant insight to the adolescent characters." "Nesbitt has crafted a sensitive portrait of a teen's uncertain relationship with a gay parent...Fans of John Corey Whaley and John Green will enjoy this realistic young adult story."